The time has come to share this recipe with you. And trust me when I say this, you 100% need to save and try this recipe! Story time. Two Thanksgivings ago I was black friday shopping with my cousins at some outlets. I was in my first trimester and have no idea why I even agreed to it in the first place. Tired, sick, hungry and shopping… I was a disaster lol! I ventured away from the group to go find a bench some where to rest for a minute. On my way to the front of the outlets, I saw a truck that said Waffle Love in a big heart. It was like it was speaking to me. Being a food blogger, I love to try out new, fun and unique places to eat and this fit all those descriptions. I purchased my waffle, lathered in Nutella topped and piled high with the most magnificent whipped cream I have ever had in my life with strawberries arranged over the top as well. The price tag was more than I have ever seen for a waffle, but hey- it was an adventure right. I had no idea what made them so pricy or why there was even a truck specializing in them. For all I knew I was about to bite into your average belgian waffle. Boy was I wrong. Very very wrong. I took one bite of this waffle and I just about passed out from sheer deliciousness. I am not treading lightly when I say that either. It was absolutely magical. I scarfed down that waffle faster than I had eaten anything in my life. I wish I had taken the time to savor each bite, but I just couldn’t get it in my mouth fast enough. Thats when I knew, whatever that waffle was, I was going to get my hands on a recipe that even remotely came close. And I have found it. I searched and scoured for a few months trying to find out what made these waffles so spectacular. And then, I found it. The dough is what set these a part. It was no ordinary waffle dough. The dough is a literal bread dough, kneaded and made with love. Lots and Lots of love and worth every effort it takes to make them. I came across the recipe on Topsy Turvey. I wanted to adapt and change some ingredients, but her recipe flavor was way too perfect and way too spot on. I did simplify the method a bit though. If you want to try out her method, that is just perfect and awesome and I am sure it is absolutely fabulous! I, however, didn’t have exactly that much time to babysit my dough but it still turned out fabulous and the consensus was unanimous that it tastes just like the Famous Waffle Love waffles. A couple things about this recipe that you will need to know before making them. 1. It requires time. Don’t start this late at night. Plan ahead. And don’t let this bullet point deter you either. It is easy work. It just requires time. And trust me- when you bite into your first waffle, you will be praising the high heavens for the sacrifice it takes. Believe you me! Start at least 5 hours before you plan to go to bed. The dough eventually will be refrigerated over night, but it does require a lengthy rest time. Truth time. I was about 5 months prego- same baby I was pregnant with for my first bite- and I literally made my husband take us on an “adventure”- or so I promoted it as such to get him to consent- on a FOUR HOUR ROUND TRIP DRIVE just to get me a waffle from Waffle Love. Pregnant Craving much? Crazy Pregnant Craving much? I didn’t care. That is how much waffle love there is in my heart for these. 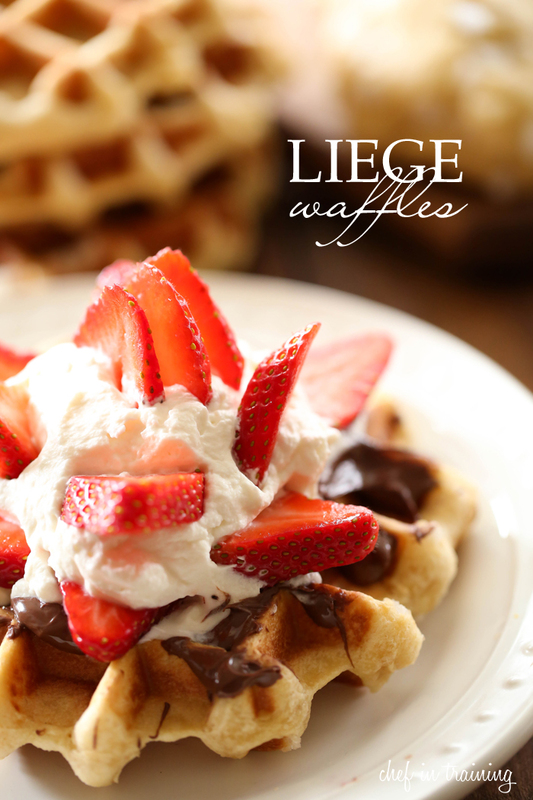 Trust me when I say, you will NEVER EVER try a waffle as delicious or special as a Liege Waffle in your entire life. It is a cross between a waffle, a donut, a dessert and all things majestic. In stand mixer, combine yeast, granulated sugar, whole milk and water. Stir to combine and let yeast sit and activate for 5 minutes. Add in eggs honey, vanilla and salt and beat until well combined. Add in brown sugar and butter and beat until well combined. Add Flour last and knead until dough is formed and is smooth in consistency. Place dough in a medium greased bowl and cover tightly with saran wrap. Let rest for about 3 hours until dough has bulked up more than double in size. Punch dough down, place back in bowl, cover tightly with saran wrap and place in fridge over night. DO NO MIX IN YOUR BELGIAN PEARL SUGAR YET. That step comes in the morning. In the morning, heat up waffle iron. Beat heavy cream on high and gradually add in sugar and vanilla until whipped cream is formed. You want it someone on the stiffer side. Remove dough from fridge, it will be very firm. Knead in the Belgian Pearl Sugars. Divide dough into 8-10 equal pieces and roll each piece into a ball. Place on greased waffle iron and cook until golden brown in color. I spread Nutella over my warm waffle, topped with Sweetened whipped cream sliced strawberries but the options are completely up to you! Oh waffles! How we all love those small and amzing pieces of heaven! These look so incredible! trader joes makes it or a company called Biscoff. It is just an optional spread topping :) You really can top them however you like! Thanks for posting! I've been looking for this recipe! Bruges Waffles and Frites in downtown SLC, UT makes these waffles, plus some twice fried Belgian french fries that are equally unhealthy and mind-blowingly delicious. They also have a location in Sugarhouse. These were AMAZING!!! We loved them with just the whipped cream and strawberries. I found the pearls at a local cooking store. They had a 8oz package for 5 dollars. Oh I forgot to mention you can buy sugar pearls from the Waffle Love truck or store! That's what I've done. I made these for Christmas morning and they are AWESOME! Worth the effort and the extra expense of the Belgian pearl sugar. I ordered the Lars brand from Amazon (thank goodness for Prime). I plan to make them again soon, but next time I will cut back on the amount of sugar - I think 1 cup (instead of 1 1/2 cups) will be sufficient. These would be great with ice cream so it's a twofer: breakfast and dessert (-: Thanks for sharing this recipe - LOVE it. I have a couple questions tho - can I half it and it still taste the same? I do NOT want to ruin the recipe in any way. And have you ever froze the dough to use days or weeks later before adding the sugar? I just returned to the foodie world and so glad I did so that I could get this amazing recipe! I immediately used your link to put the Belgian Sugar in my cart on Amazon and right back so that I could pin the recipe! I buy some Belgian individually wrapped waffles at Sams Club that have that sugary crunchy bite and they are amazing. I can't wait to try to make them myself. Thank you for sharing!!!! You mention that the dough is very stiff, and it looks that way in your picture. So do you flatten it by hand when you put it into the waffle iron? Or does closing the waffle iron do the work? These look delicious, and I really want to try them. What do you grease your waffle iron with? Cooking spray, butter, shortening? Thanks! My dough is pretty sticky. It's sticking to the counter while I knead it. Is this normal? I guess she's not commenting in this recipe any longer. I will agree with you. 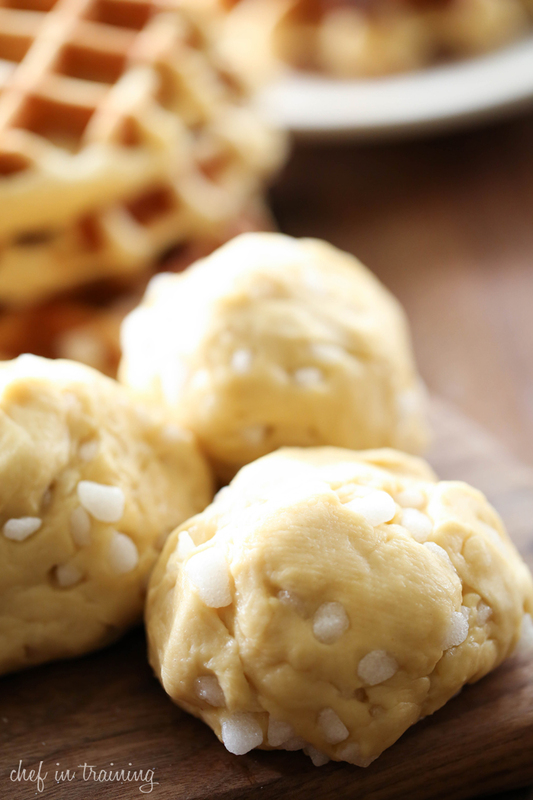 My dough is always sticky with this recipe, but the waffles still come out delish! What temperature do you cook them at? I tried another recipe and the center always seemed too doughy but the outside was really hard. And how long? Also how long can they stay on the fridge? If I wanted to use them at night instead of in the morning are they ok to sit in the fridge that long? I spent all night very excited about trying this recipe mixing, kneading, rising, in anticipation to cook up this batter and try my first Liege waffle. They came out heavy , not light and fluffy. Very disappointed! This looks amazing! I am late into the waffle love fan club and have only had one, but that was enough...I am in love! Is the pearl sugar the way the waffles get the sugar coating on them? The one I had seemed to be encrusted in cinnamon sugar. Any ideas how to reproduce that? Thanks in advance and thanks for all your great recipes!!! Made this twice-both times with disappointed results. The dough doesn't really rise and the batter is heavy, not light at all. I've since made the waffles using another recipe I found on-line with fantastic results using the same ingredients. Very disappointed. This recipe is amazing, came out to taste better than the local shop that sells liege waffles. I have to add that I have tried kneading it by hand and using my new Kitchen Aid, and using the kitchen aid kneading attachment made a huge different. I made this 4x already so far 3/4 time was a successful. The one time that wasn't successful, I am pretty sure I screwed up on measuring the amount of yeast I had to use, because my dough was flat and didn't rise. I shift my bread flours, not sure if that makes a difference. I also tried to freeze my waffle and reheat for my kids at a later time and it taste just as good and just as fresh. worth the effort. I also order my pearl sugars from Amazon. Will be making more for the Christmas holiday. The first time you eat them you can't help but think of Christmas! We have been making them on Christmas morning three years running! Hi Nikki. I love your recipes and always trust that they will turn out. Ina is the only other person I say that about. :) I was wondering if you'd ever tried freezing made waffles and reheating them. I realize anything is better served just made but I'm having lots of company and I don't think it would be realistic to make them fresh for each person. Thanks! I moved to Portland just over a year ago and found it a renowned Waffle Window about three months ago. I've not been able to put my finger on how to make their leige waffles until I found this recipe. I love love love the savory toppings on the sweet waffle: bacon, basil, cheese, tomatoes and other vegetables make this really versatile for meals other than breakfast. I will say I got impatient and cooked them after only an hour on the second rise, rather than an overnight in the fridge,and I also made my own sugar pearls from white sugar because I didn't want to wait for the pearls to arrive. It turned out amazingly anyways. I can't wait to make these for family in the upcoming months of holiday. Thanks! I made these today and, as a few others have said, mine came out very dense and heavy. Is that hoe they're supposed to be? They tasted very good, but i couldn't finish one bc it was so dense. Any ideas what I might have done wrong? My sugar pearls didn't dissolve or melt like they are supposed to. Still hard clumps in the waffle. I tried cooking the waffle longer but it ended up being over cooked. Any idea what I did wrong? I've made this recipe a couple times now and am gearing up to make it again Christmas morning... it's fantastic! Really. They are amazing! It's hard to eat any other waffle! Rhsnk you for sharing this incredible recipe! I'm trying to figure out if I can make about 70 of these and just microwave them when I'm ready to use them for a big youth group activity. Is that totally going to ruin the texture? Not sure who reads these before cooking, but just Incase, I’ll mention a few tweaks I will be doing next time. First, way too much sugar— not necessarily because it was too sweet, but because sugar burns quick and there’s not enough time to melt the sugar in the middle. There were chunks of hard sugar in mine. Quick fix, I just wiped most of the sugar out of the remaining balls. Secondly, wafflelove and Bruges use specialized irons, not like normal families own— due to the sugar burning, so turn your iron down quite a bit. The dough here is otherwise spot on and something I’ll keep coming back to! These are delicious and my family absolutely raved about them... but they are very messy and cleanup took forever on 2 electric belgian waffle irons! I may have to buy a stovetop waffle maker... but I have to decide if it's worth the prep and cleanup time (a stovetop waffle make would make cleanup easier). We used sugar cubes broken up with a mallet instead of pearl sugar. My husband couldn't stop saying how great they were. Forgot to put my rating with my review comment!